I was so excited to return from my holiday last week to my The Vegan Kind #TVK19 subscription box! I had also successfully managed to avoid any spoilers online so everything this month was a total surprise! This was also the first month that my TVK box & my TVK Beauty Box arrived together so it was like double the joy and excitement! Chika's Chilli Plantain Crisps - These were demolished pretty quickly and thoroughly enjoyed! It seems like Plantain snacks are really quickly becoming a more and more popular vegan food and healthy alternative to crisps. I really enjoyed the crunchy, sweet and chilli kick these hand cooked crisps had to them. A big thumbs up from me! Sarelle Hazelnut & Dark Chocolate Cream Filled Wafer - This was unbelievably good and has quickly made itself into one of my top spots for an awesome vegan chocolate bar! It reminded me a bit of a Kinder Bueno with both it's light texture and wafer filling. I will definitely be buying again! Ecobamboo Toothbrush - I couldn't believe my eyes when I saw this eco bamboo toothbrush in this months box as I have been saying for weeks now I really want one of these and literally just haven't gotten around to ordering one! Its like TVK read my mind! So I am really happy to now finally have my hands on one of these vegan friendly and 100% biodegradable toothbrushes. My husband was a little jealous so I have just taken advantage of the 10% offer and ordered him one too! Olive Branch Mezzo Sundried Tomato Paste - So far my husband has used this paste in his pasta dinner and he really loved it. Similar to a pesto consistency, it's a good vegan alternative to pesto and is a quick and easy addition to a pasta, pizza or bruschetta. We're looking forward to trying it out on this months recipe for vegan pizza potato skins! Good Full Stop Fruit & Nut Mint Chocolate Bar - I am a big fan of mint chocolate so this bar didn't disappoint! It is definitely a healthier alternative snack with crushed dates and nuts ingredients and something that I would probably pick to have within my packed lunch. Taking The Pea Sweet Chilli Salsa - These were SO good and were the first item from this months box to get quickly demolished by myself, my husband and my Mum! We all absolutely loved them. It's just a shame that I had to share them! I think its fair to say that I am slightly addicted to peas anyway and if theres an opportunity to add them to a meal I will, so it's great to see them now evolving into the world of snacking too! Peas are high in fibre and protein and therefore are the ultimate healthy vegan food. So another month and another great box! One of the best things that I have done since becoming vegan is sign up to this subscription box. In my opinion it is the best vegan subscription box out there which really helps in finding new vegan alternatives for your food cupboard and your cosmetics drawer! I think it's a must if you are transitioning into a vegan lifestyle! 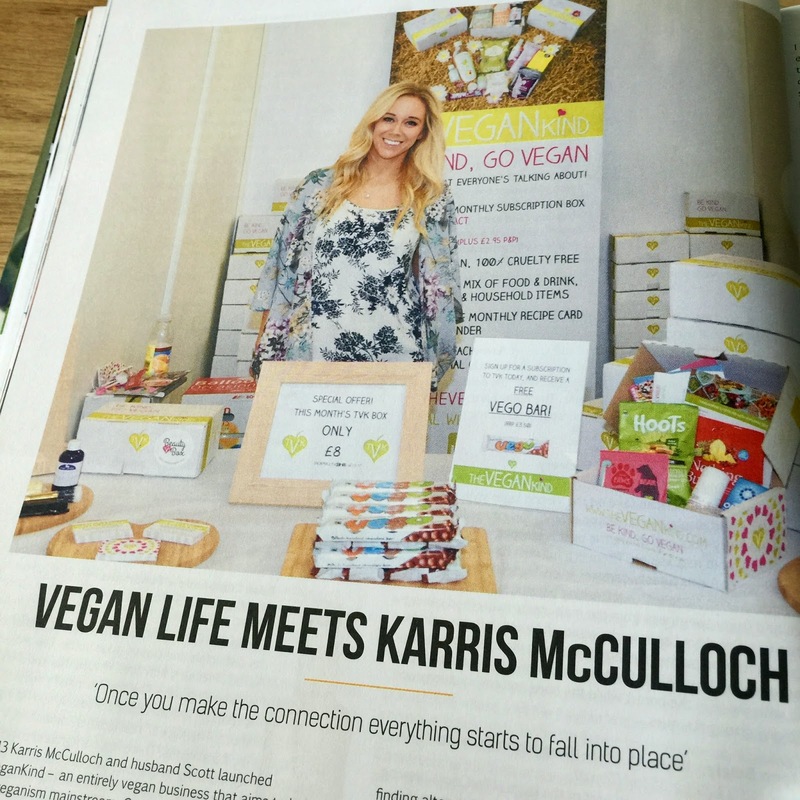 It was also so lovely to see TVK owner Karris McCulloch featured in this months Vegan Life magazine. She is an absolute inspiration to all of us vegans and I think I have a bit of a girl crush on her! Well done Karris on another fab month for The Vegan Kind and it's awesome to see your business go from strength to strength! That all sounds delicious, especially the peas. I love anything spicy, so I'd have demolished them immediately too. How much luck was getting that toothbrush in the box? I rarely get anything that I've had my eye on. Great post. P.s. The above comment from Lisa was actually from me. I was still logged into her account and forgot.